When our self-esteem is low, which is typical of codependency, we’re at greater risk for depression. 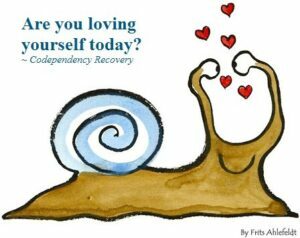 Codependency is learned, and so are self-esteem and the beliefs and habits that cause both low self-esteem and codependency. Self-esteem is what we think about ourselves. It includes positive and negative self-evaluations. Good self-esteem is a realistic, positive self-concept. It reflects self-respect and implies a feeling of worth that’s not determined by comparison to, or approval from, others. Self-acceptance (which some writers include as part of self-esteem) is even deeper. It’s a feeling of being good enough, neither perfect, nor inadequate. We feel we have worth and are lovable, not merely because of beauty, talent, achievement, intelligence, status, or popularity. It’s a sense of inner contentment. We each have intrinsic value, not based on how we perform or what we do or give. Just as every baby and breed of animal are unique and worthy of love, so are we. Unfortunately, as codependents, many of us grew up in families where love was nonexistent, conditional, or had to be earned. We believed that we had to earn or win the love of a parent. As a result, we’re afraid to be authentic for fear we may be disliked. We may pursue people who cannot love and reject those who love us. We “over-do” or “over-give” in relationships and at work, and end up feeling resentful, used, or exploited. When we compare ourselves to someone else, whether favorably or unfavorably, we are measuring ourselves by an external standard. Feeling “better than” someone is really a means to compensate for underlying shame and low self-esteem. The lift we get is false. It would be more helpful to wonder why we need to compare ourselves to someone else. When we compare ourselves negatively, it’s self-shaming. We feel inferior, lose confidence, and like ourselves less. It depresses our mood and discourages us. An active inner critic besieges us with what we should and should not do and second-guesses what we’ve already done. Habitual fault-finding can cause us to assume others see us as we see ourselves. In this way, we project our critic onto others and anticipate and feel the effects of criticism or judgment that we imagine, even when none occurs. This leads to shame anxiety, people-pleasing, and conflicts in relationships. Lowered self-confidence causes us to fear making mistakes, looking foolish, or failing. Our self-esteem is always on the line, so it’s safer not to try anything new to avoid appearing incompetent or not succeeding. This is another reason we procrastinate tasks or experiences that are new or challenging. At the same time, we nag and criticize ourselves for failure to accomplish our goals. Rather than take a chance, we make ourselves wrong for not trying, which ensures “failure” and low self-esteem. Accommodating others from an early age leaves us unsure of our values and beliefs and encourages reliance on others. Decision-making becomes difficult, even paralyzing. Low self-esteem and shame heighten our fear of making mistakes, leading to self-doubt, insecurity, and indecision. Instead, we procrastinate or look to others for validation, opinions, and answers, which further undermines our self-trust and self-esteem. Accommodating others also alienates us from our needs and wants. By not acknowledging, expressing, and meeting our needs and wants, we’re admitting to ourselves and others that they’re not important; ergo, that we’re not important. On the other hand, taking responsibility to meet our needs and/or ask for them (such as asking for a raise) builds self-esteem. When we don’t, we feel helpless and a victim of circumstances and other people. Cognitive-behavioral therapy (“CBT”) is effective in treating both codependency and low self-esteem. Research has consistently found a link between depression and low self-esteem, and also that raising self-esteem using CBT reduces depression. [i] Treating any underlying trauma is also important, particularly when it’s focused on changing erroneous and self-shaming beliefs. Many CBT exercises are included in my books. (Also available on Amazon.) To overcome self-criticism, follow the steps in 10 Steps to Self-Esteem: The Ultimate Guide to Stop Self-Criticism. Learn to be assertive and set boundaries, do the exercises in the ebook, and webinar, How to Be Assertive. To dig deeper, discover and heal the roots of shame in your childhood, get Conquering Shame and Codependency: 8 Steps to Freeing Your True Self.